In Diagramming Spring MVC webapps, I presented an approach that allows you to create a fairly comprehensive model of a software system in code. It starts with you creating a simple base model that includes software systems, people and containers. With this in place, all of the components can then be automatically populated into the model via a scan of the compiled Java code. This is all based upon Software architecture as code. Once you have a model to work with, it's relatively straightforward to visualise it via a number of views. In the Spring PetClinic example, three separate views (one each of a system context, containers and components view) are sufficient to show everything. With larger software systems, however, this isn't the case. 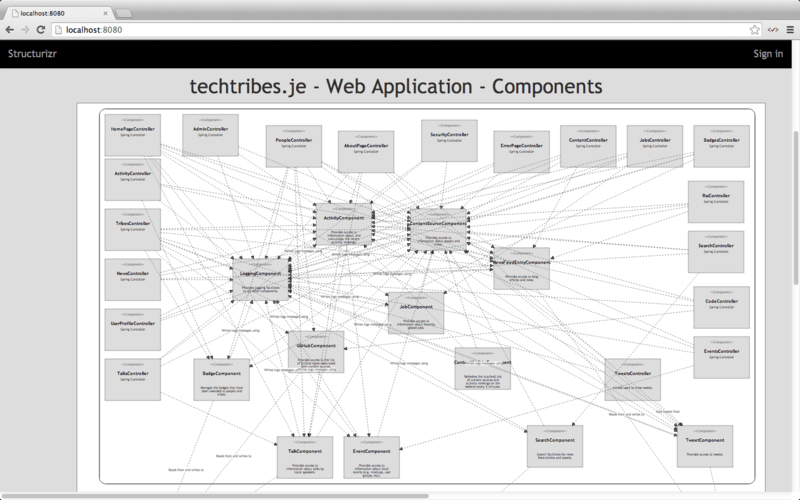 As an example, here's what a single component diagram for the web application of my techtribes.je system looks like. Yup, it's a mess. The components around the left, top and right edges are Spring MVC controllers, while those in the centre are the core components. There are clearly three hotspots here - the LoggingComponent, ActivityComponent and ContentSourceComponent. The reason for the first should be obvious, in that almost all components use the LoggingComponent. The latter two are used by all controllers, simply because some common information is displayed on the header of all pages on the website. I don't mind excluding the LoggingComponent from the view, but I'd quite like to keep the other two. That aside, even excluding the ActivityComponent and ContentSourceComponent doesn't actually solve the problem here. The resulting diagram is still a mess because it's showing far too much information. Instead, another approach is needed. With this in mind, what I've done instead is use a programmatic approach to create a number of views for the techtribes.je web application, one per Spring MVC controller. The code looks like this. The result is a larger number of simple diagrams, but I think that the trade-off is worth it. It's a much better way to navigate a large model. 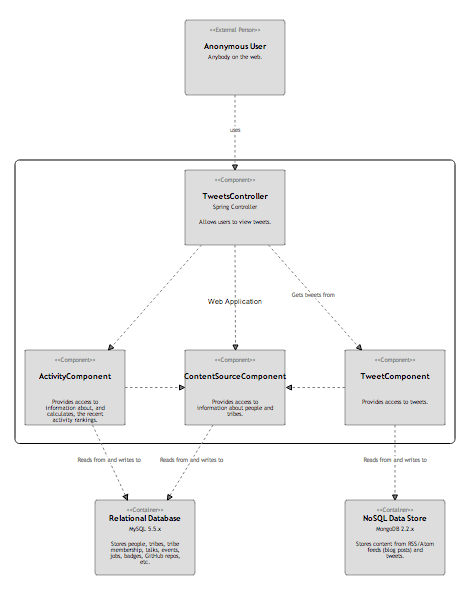 And here's an example component diagram that focusses on a single Spring MVC controller. Re: One view or many?